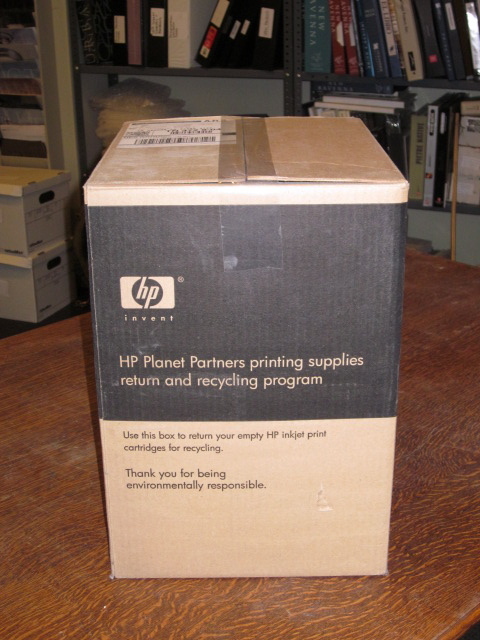 On a Monday in July 2007, the halcyon days of the economy when I was paid significantly better — before my wages were radically reduced in 2009 and have remained as frozen as a dead polar bear in the Arctic ever since, my boss, Elsbeth, arrived at work carrying a flat HP Planet Partners Return and Recycling box. This box was for her used home printer cartridges. She was feeling very proud of herself for being environmentally responsible. 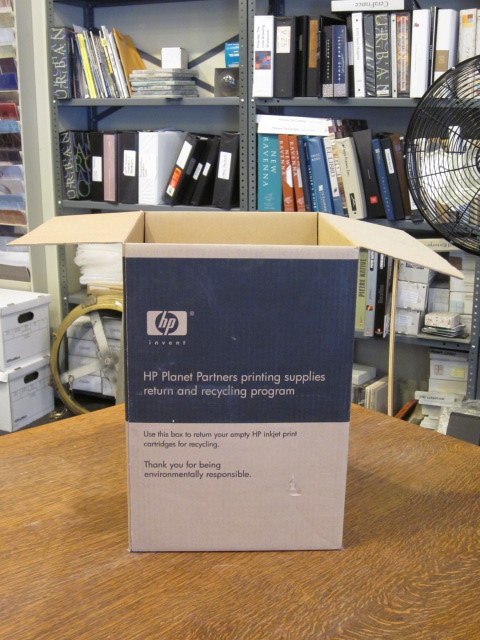 Elsbeth: When we fill up this box, we ship it back to HP – postage paid! Me (placating tone): Okay, we’ll do that. I knew that the we she was referring to was actually me. My lord and master proceeded to assemble the box. She then placed it in the warehouse outside our office where I proceeded to forgot about it. Me (thinking): It’ll take her a hundred years to fill that box! Ha! There’s some schmuck or schmuck-ette out there right now that’ll be stuck shipping it back. Loser! 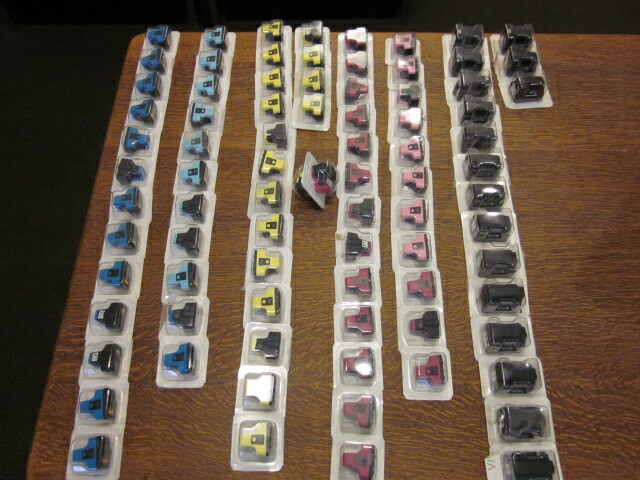 Fast-forward four years, two months and 84 cartridges later … On a recent Thursday Elsbeth enters our office, excited. Elsbeth: My box is full! We have to return it! The night before, I had been up until 5 am writing. Therefore, I was not at my most coherent. In fact, I seem to recall being 90% asleep. I slap myself in the face and hack a hairball. Me (thinking): Where’d that come from? Me (saying): Huh? What box? Elsbeth: My printer cartridge box! It’s filled up! We have to return it! Me (zero enthusiasm for I know this means I have to move my exhausted carcass): I’ll deal with it. Me (easily saying): Screw this. And then seal the box as is, the lapsed Catholic in me knows that’s wrong. Sighing so loudly, the flock of pigeons perched outside the windowsill takes flight; I proceed to repack all the cartridges. 84 spent HP printer cartridges. Siamese twin adhered yellow and magenta cartridges that apparently brought out the mad scientist in my boss. Yet, I suppose things could be worse, I could be unemployed or I could be my friend, Coco, who the next day encountered, in the middle of our luxury showroom floor, a customer that breast-fed a toddler that was so large, this kid could easily try out to play on the Knicks – whenever basketball season gets underway again. I know I’d much rather repack a box while suffering a coma than have that site shoved in my face. 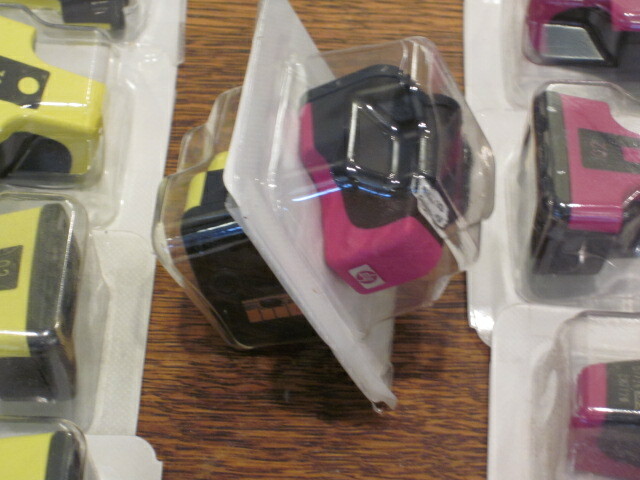 Sealed repacked box good to go home to HP. This entry was posted in Humor and tagged hewlett packard, HP, office, printer. Bookmark the permalink. Good to know the planet is safe again, and we can all get back to work–making so little money. Yes, Max, I am a scrivener! Coco will love that story!